For midweek dawn patrols, all-night approaches, or just big climbing objectives that push beyond daylight, the Black Diamond Spot 325 has 325 lumens of power, now housed in a smaller, more efficient design. With a new, compact body, the Spot 325 has been redesigned with a lower profile for better balance and is more ergonomic for added comfort. The user interface has also been uptated by adding a second switch for easy lens mode selection. In addition, the updated optical efficiency not only provides brighter light with more peak intensity, but also saves battery life that you can now easily track with a six-setting, three-LED battery meter. The Spot 325 also offers peripheral lighting for close-range activities like sorting gear, cooking, or reading in camp and it sports an IPX8 waterproof housing. The Brightness Memory feature allows you to turn the light on and off at a chosen brightness without reverting back to a default setting. Plus, the Spot325’s PowerTap Technology makes for instant brightness adjustment settings. 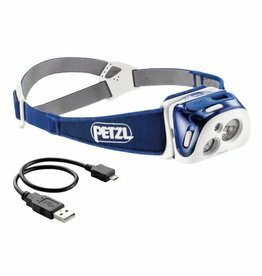 The Reactik is a compact, rechargeable and intelligent headlamp with reactive lighting technology that automatically adjusts brightness to the needs of the user.